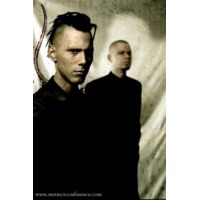 In Strict Confidence is a German electro-industrial band. Formed in 1989/1990, they were known as Seal of Secrecy until 1992. In Strict Confidence has been signed to several record labels, including Metropolis Records and WTII Records. In Strict Confidence started out as a quartet, but stripped down to a duo (Dennis Ostermann and Jörg Schelte) in 1992, releasing two demos tapes on the way to their debut release 'Cryogenix' on Zoth Ommog in 1996 (the initial pressing of this album sold out in one week), shortly followed by an EP 'Collapse'. The band left the label after releasing follow-up effort 'Face The Fear' in 1998, releasing their third album 'Love Kills!' on Bloodline two years later.